We hope you can join us as we put our hands to the aina to malama Kaloko. 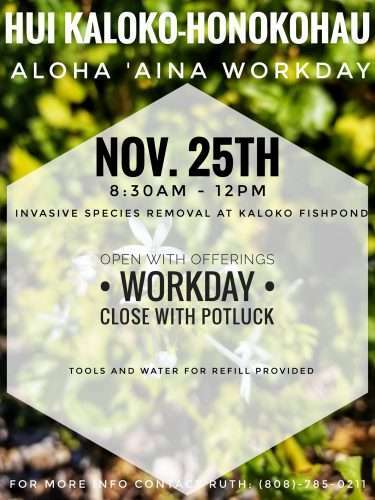 Work at Kaloko Fishpond will begin at 8am and last until just before lunch. Please join us for potluck and talk story to follow at the Kaloko picnic area. Please meet us at Kaloko Fishpond Parking Lot at 8am for opening and safety briefing. For this workday, we will continue to focus on the removal of non-native, invasive pickleweed from the south and eastern shores of Kaloko, removal of invasive woody plants along the shoreline, removal of invasive jellyfish (Cassiopea andromeda) from the pond as well as continue the water parameter readings so that we better understand the existing conditions in Kaloko. Close-toed shoes are required for work at the fishpond. Sturdy, thorn proof shoes are recommended as we will be working in the kiawe forest. We have rubber boots and tabis available for your use but depending on how many people show up, we may not have your size. So if you can, please bring your own pair of close-toed shoes. A hat, reef-safe sunscreen, long sleeve shirt, long pants and/or tall socks are highly recommended. Water, tools, rubber boots/tabis and gloves will be provided. We will be having a potluck style lunch at Kaloko following the work. We are very fortunate to have Hui Kaloko-Honokohau, a devoted group of aina stewards, partner with the National Park Service at Kaloko-Honokohau National Historical Park. 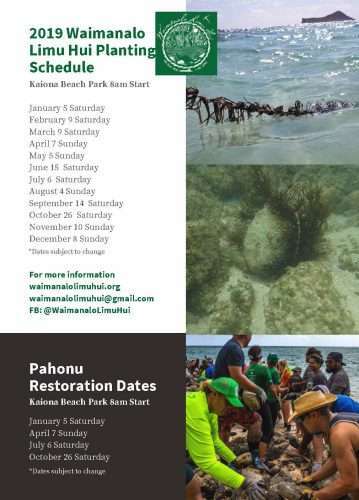 These monthly workdays are a great way to take part in the rehabilitation of the cultural landscape at Kaloko-Honokohau. With the aina as our foundation, we will work as a community to nurture and be strengthened by the Spirit of this wahi pana. Malama Kaloko.